Here at the Caterham Chiropractic we are happy to provide treatment for people suffering from Runner’s Knee. Runners knee, also known as Patellofemoral pain syndrome got it’s nickname due to the high amount of people that run have ended up suffering from it! The symptoms of the condition are seemingly from the back of the kneecap to the thigh bone. The pain can be mild and can develope into sevier pain if untreated. The best treatment for Runners Knee. One of the best treatments for runners knee is laser therapy wich we are happy to prive here at the Caterham Clinic. Laser treatment can rapidly speed up the recovery process of Runners Knee and is a highly reccomended trewatment option. This acompanied with mucled strenghtening exercizes is the best treatment and will have you back on the track in no time! Who is more likely to suffer from Runners Knee and how to tell if i have it? As the name suggests, if you’re a runner, you are more susceptable to Runner’s Knee! The main symptoms of Runners Knee are mild to severe knee pain, crepitus (noises when moving your knee joints) and giving way of the knee(s). What can I do to relive pain from Runners Knee? If you believe you are suffering with Runner’s Knee you should book in to see a chiropractic before the issue gets any worse. The best thing you can do once you start to feel any pain in to rest the affected area. With laser therapy and exercises that will strengthen the knee and legs, you will be back on your feet in no time. In summery, if you spend a lot of time on your feet or running and are having concerns about runner’s knee being an issue for you, book yourself in for a consultation with one of our chiropractics at the Caterham Clinic. They will guide you though the process of fixing the issue and help you to rehabilitate to get you back on your feet. Plantar Fascittis is an injury in the foot that is caused by a rupture or stretching of the Plantar Fascia. Plantar Fascittis can also be known as policeman’s heel and it is believed that repeated small injuries over time to the Plantar Fascia is the main cause of the inflammation. Here at the Caterham Chiropractic we’re proud to provide treatment for Plantar Fascittis. Main causes for Plantar Fasciitis. Spending lots of time on your feet or doing lots of walking or running when you’re not used to it. If you are inactive in your day to day life then you may be more prone to Plantar Fasciitis. If your Achilles Tendon is tight then this can have an affect on your ability to flex your ankle and may make you more likely to damage your Plantar Fascia. Having poor cushioning in your shoes could be a cause for Plantar Fasciitis. Being overweight will put more stress on the Plantar Fascia and can contribute to Plantar Fasciitis. For runner, poor tecniques from starting a race ‘Off The Blocks’ can strech the sole of your feet leading to pain from Plantar Fasciitis. The first thing you should have done is Conservative Therapy. You should be seen by a medical practitioner such as a Chiropractor, Physiotherapist, Podiatrist or Osteopath. They will then give advice and give manual therapy on the calf and foot areas. Changing you shoes or modifying your current footwear can also be very helpful. You may be advised to invest in some heel cushions to relieve the pressure from the painful part of your heel. We would highly recommend you give first line treatment for at least three months before considering moving to further treatment such as Shockwave Therapy or steroid injections. Shockwave Therapy For Heel Pain. Your first consultation with us is free and we will use this time to ascertain your suitability for certain types of treatment and answer any questions you may have on the subject. If we believe you will need Shockwave Therapy, we will arrange 3 to 4 sessions at weekly intervals for your treatment with our state of the art Stortz Shockwave Therapy machine. Each session of Shockwave Therapy typically takes around 30 minutes, these sessions will include acupuncture, passive stretching advice and footwear. Patients may experience some small discomfort during the procedure and there may be a little redness on the skin after treatment, this is a normal reaction to the treatment. In some instances the foot pain may increase slightly before getting better. How Does Shockwave Therapy Work For Heel Pain? – Shockwaves cause micro damage to the tissue in affected areas and in doing so, stimulates healing. The treatment has an effect directly on the nerve endings which makes them less sensitive and thus less likely to transmit pain. The main benefits from Shockwave therapy are not experienced until the patient has had 3 sessions and has an 80% success rate with clients. The effect of Shockwave Therapy is usually permanent and there will be no reason to return for further treatment. The National Institute for Health and Clinical Excellence (NICE) have recently evaluated the effectiveness of Shockwave Therapy for heel pain in 2009. Their recommendation was that the treatment is effective and should be offered to patients with heel pain. You can read all about NICE here www.nice.org.uk. We’re delighted to inform our patients that we will now be offering Low Level Laser Therapy (LLLT) at the Caterham Chiropractic Clinic. The treatment is an extremely safe, effective and painless painless way of treating a vast range of conditions such as tissue damage, osteoarthritis, post operative pain and strains/sprains of tendons or muscles. The treatment uses Laser and LED light beams which have been proven to stimulate and repair tissue and reduce inflammation and pain. The treatment is effective for chronic pain, acute soft tissue injuries and slow healing wounds. 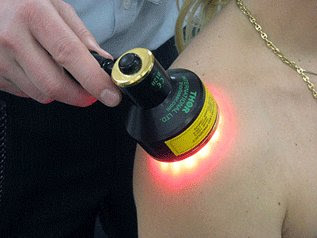 Low Level Laser Therapy creates photons of light at the near infrared frequency. This has been shown to stimulate production of adenosine triphosphate, which is where our cells get their ‘fuel’. This in turn gives our cells more energy to be able to repair and heal themselves. We offer the best evidence based treatment to our patients due to working with Thor Lasers. Thor Lasers are used by many large organisations such as; The British Army, The Royal Air Force, NASA & Manchester United. Low Level Laser Therapy is a technology that has been proven to be incredibly safe and effective treatment for acute injuries and chronic pain. LLLT has been very helpful with patients suffering from difficult to treat issues such as chronic neck and back pain, arthritis, plantar fasciitis and other muscle and joint pains. It’s a great drug free, non-invasive way of accelerating the healing of injuries. The treatment involves application of red and near infra-red light over the injury. The Laser and LED light stimulates the cells in your body that repair tissue and reduce inflammation, which in turn reduces pain. Low Level Laser Therapy is a highly effective treatment for those suffering with Chronic pain, acute soft tissue injuries and slow healing wounds. Therapeutic Benefits Of Laser Therapy. Increased Vascular Activity – Laser light increases blood flow to the injured area. Anti-Inflammatory Action – Laser light reduces swelling, leading to less stiffness and decreased pain. Faster Wound Healing – The laser stimulates fibroblast development and helps to accelerate collagen synthesis in damaged tissue. Stimulated Nerve Function – The laser speeds the nerve cell processes which can lower pain and numbness associated with some nerve related conditions. Reduced Fibrous Tissue Formation – The laser reduces the formation of scar tissue, leading to a faster and more complete healing process with less chance of weakness and re-injury. Fractures and non union fractures. Chronic Pain Syndromes such as Frozen Shoulder, RSI and chronic low back pain. Post operative pain, Infected wounds and tendon repair. Low Level Laser Therapy is a quick process that can be used immediately after injury and usually has no side effects (you may occasionally experience mild ache after treatment.). It’s a great drug free pain relief option for our patients. Some patients will feel immediate relief and get immediate results, others require 4-10 treatments before they notice a lasting effect. The less sever the issue, the fewer treatments the patient will need. The frequency of treatment is 1-2 times a week for 2-3 weeks and then 1 time per week for a further 2-6 weeks. The use of Low Level Laser Therapy will speed up your injury recovery time and will reduce pain a lot faster, meaning you can get back to your day to day life a lot quicker. It is a great alternative to taking painkillers that can leave you with nasty side effects. Advantages Of Low Intensity Laser Therapy. Firstly nearly all of us will suffer from occasional headaches, some more than others. Chiropractic treatment can help chronic headaches. According to a study carried out in North America, Europe and Australia approximately 10% of all chiropractic patients attend for the treatment of headaches. However sometimes in rare cases, headaches and migraines, can be a sign of more serious problems. So if you suffer from recurrent or chronic headaches it is often good to seek professional advice. The first of which is tension headaches. These are caused by cramps or spasm in the muscles surrounding the skull. The second are neck (cervicogenic) headaches. These are caused by problems of the joints and muscles in the neck referring the pain into the head. How does chiropractic treatment help? Chiropractors will use a variety of specific manipulation or adjustment techniques in order to stretch, relax, mobilise the neck joints, strengthen the neck muscles and remove any spinal irritation or tension. One of the most common side effects of pregnancy for women across the country is back pain. It’s no wonder back pain is such a common complaint, as the body is gaining more weight, your centre of gravity is lowered and your ligaments are starting to relax to prepare your body for labour. Most women often find back pain most intense when they’ve been in the same position for along time as the muscles start to become stiff. Always make sure to change your position regularly and use the appropriate support, such as a cushion when sitting or sleeping, and a lumbar role when exercising. Posture can also be key to managing lower back pain. When you’re moving around make sure to bend from the knees and keep your back straight. Don’t forget to move your feet when turning as this can help prevent excess twisting on the spine! Keep these principles of good posture in mind to help relieve any stress on your spine: stand up straight and tall, hold your chest high, keep your shoulders and back relaxed and use a comfortably wide stance to keep your upper body fully supported. Exercising in water, such as attending aquanatal sessions, can be an effective way of exercising the muscles without out causing any damage. This is due to the fact the buoyancy of the water can help provide you with the extra support your body will need! Although back pain is common during pregnancy, it is important to make sure you’re getting the right exercise. Attending a class or speaking to a GP is a useful way to know you’re taking care of your body in the best way possible. Try some gentle yoga exercises or going for a walk as a way to incorporate some exercise into your day and keeping your muscles active. One of the most likely times women will get back pain is during pregnancy and for men and women, it is when there is an infant in the house needing to be picked up and carried. Both these times are paradoxically when you would like your back to be functioning at it’s best. Caring for an infant puts stress on your back. Initially, you may be lifting the 7 to 10 pound baby up to 20-30 times a day. By the time the child is a year old, you are lifting and carrying around 17 pounds. Two years later, you will be lifting a 25 to 30 pound child. Here are some ways that new mothers and fathers can help reduce their risk of injury and back pain. During pregnancy stand with your feet at least a foot apart, this will give you a stable base of support. Keep your back as straight as possible and bend your knees. Do not stretch your arms out straight to pick up the baby. Bring the baby close to your chest before lifting. Lift using both arms and your thigh muscles, which are amongst the largest and strongest muscles in the body. To pick up a child from the floor, bend at your knees not at your waist. Squat down, tighten your stomach muscles and lift with your legs. When carrying and moving a child, pivot with your feet until you are facing your destination then lower the child into the crib or onto the floor by bending at the knees, with a straight back. Hold your child in an upright position, directly against your chest. Carrying a child on one hip creates postural imbalances that can lead to low back pain over time. Consider using a “front pack” to carry the baby when you are walking. Begin exercising again soon after delivery to restore muscle tone to the abdominal and back muscles. While the baby is napping, take 10 minutes to do stretching exercises on the floor each day. This will help restore hip and back flexibility. Try to return to your normal weight within six weeks after giving birth. If you had a Caesarean-section (C-section) delivery, wait six weeks or until you get the permission of your obstetrician before you begin exercising. Massage has had positive results in surveys for many different conditions. Conditions from stress and aches and pains to pregnancy and headaches. However, it is still not entirely clear why these benefits occur. Most recent research suggests two of the greatest changes induced by massage therapy are an increase in blood flow and in lymphatic fluid circulation. The lymphatic fluid is an important element of the immune system as it contains white cells; and the drainage system, which rids the body of unwanted by-products and toxins. Massage can increase the effectiveness of both systems by increasing the flow of lymphatic fluid. Increased blood and lymph circulation will bring about a reduction of swelling. It will also bring about faster healing, better delivery of nutrition to cells and the removal of cellular debris; it can also lower heart rate and blood pressure, increase the volume of blood and enhance overall health. Massage can we used to treat acute and chronic sports injuries, It also helps maximize recovery. To help identify any soft tissue abnormalities, which left untreated, could lead to injury. Sports injury massage should not be during the acute inflammatory response stage (straight after an injury). Once this period is over. Massage is often a very effective form of pain relief. By reducing the amount of pain producing chemicals in the affected tissues. Regular, professional massage has also been shown to increase the healing time for athletic injuries. Massage also calls up the body’s natural painkillers, endorphins, into the brain and nervous system. It often provides deep relaxation as it relieves muscle tension, spasm, and stiffness, which can all contribute to pain. Experts suggest that tense muscles are usually deprived of oxygen because the tightness reduces blood circulation to the area. Massage improves blood circulation, bringing with it the oxygen and other forms of nourishment that muscles need. Muscles then relax and pain often decreases. Have you checked the object before you try to lift it? Test every load before you lift by pushing the object lightly with your hands or feet to see how easily it moves. This tells you about how heavy it is. Remember, a small size does not always mean a light load. Is the load you want to lift packed correctly? Make sure the weight is balanced and packed so it won’t move around as loose pieces inside a box can cause accidents if the box becomes unbalanced. Is it easy to grip this load? Be sure you have a tight grip on the object before you lift it. Handles applied to the object may help you lift it safely. Is it easy to reach this load? You can be injured if you arch your back when lifting a load over your head. To avoid hurting your back, use a ladder when you’re lifting something high. What’s the best way to pick up an object? Use slow and smooth movements. Hurried, jerky movements can strain the muscles in your back. Keep your body facing the object while you lift it. Twisting while lifting can hurt your back. “Lifting with your legs” should be done only when you can straddle the load. To lift with your legs, bend your knees, not your back, to pick up the load. Keep your back straight. How can I avoid back injuries? Don’t overdo it – don’t try to lift something too heavy for you. If you have to strain to carry the load, it’s too heavy. Make sure you have enough room to lift safely. Clear a space around the object before lifting it. Look around before you lift, and look around as you carry. Make sure you can see where you are walking. Know where you are going to put down the load. Avoid walking on slippery, uneven surfaces while carrying something. Don’t rely on a back belt to protect you. It hasn’t been proven that back belts can protect you from back injury. Get help before you try to lift a very heavy load. Use a dolly or a forklift if you can. Balance and co-ordination are an often overlooked part of fitness and should be trained as much as strength and endurance. Several parts of the body control balance and c0-ordination. This includes the eyes and the ears. These senses pass on the data via the nervous system to the muscles to co-ordinate movement. In older people, though, these senses deteriorate and as a result, the balance may worsen. Improving balance and coordination can benefit everyone, especially the elderly, and make you healthier and fitter. However, there are many factors that may hamper your balance and coordination. The alignment of your neck, your spine, and your pelvis is one. When your pelvis is misaligned, your body needs to compensate and your neck or back may shift to one side so you can keep your balance, but this, in turn, causes you stiffness and neck pain. Age and disease can also contribute to poor balance. With poor balance, the elderly are prone to slips and falls. It hinders mobility and lessens the overall quality of life. Diseases such as arthritis and osteoporosis hamper balance and coordination. Regular exercise improves flexibility, strength, balance, and coordination. Many sports, the gentler ones such as lawn bowls as well as the more athletic one, strengthen muscles which help to prevent misalignment. Nutrition too is another important aspect of a healthy life. Important nutrients for balance and coordination include sodium, calcium, potassium, and magnesium as they are needed in regulating nerve impulses and muscle activity. Active recovery from chronic back pain and how to help! Active recovery from chronic back pain. Having treatment for chronic back pain? Don’t overlook rehabilitation. It is an essential part of any recovery programme if you want to avoid the recurrence of pain. Once the cause of each episode of pain is pinpointed and treated. An exercise programme can draw up and supervised to help prevent recurrence. When stretching your muscles you should be doing it slowly and gently. After around ten seconds the stretch starts to have maximum benefit. A stretch should be held for at least 20-30 seconds. It is important not to bounce as you stretch, which may cause damage and does not improve flexibility. Aerobic exercise releases stress-reducing hormones and burns fat and also increases your sense of well-being. It therefore, works in two ways. Firstly it will be strengthening muscles to make pain episodes less likely. Secondly, it will also reduce the tension that can cause initial injury. Avoiding back pain whilst on the road! Many drivers don’t realise that the back pain or a stiff neck may primarily be caused by bad driving habits. Although you might not always feel it while you’re on the road, It still causes pain! Most of us spend a good couple of hours a day in our cars. This could be commuting to and from work or running errands. This may cause us to suffer from aches and pains known as Repetitive Driver Injury. According to the British Chiropractic Association (BCA), 40% of people say that simply sitting down for long periods of time exacerbates neck and back pain. Drivers commonly suffer from pain and stiffness in their lower back and neck due to irritation of the spinal joints. Long periods of time on the road puts extra strain on the vertebrae and discs and we lose the lumbar curves in our backs. Avoiding back problems while driving may not require anything drastic, such as, buying a new car, however, taking practical measures should help drivers feel comfortable behind the wheel. After a long journey muscles can become very stiff, therefore, simple exercises, such as side bends and seat braces, are very effective. Most importantly, remain relaxed whilst driving and take breaks. If you have any issues you should book in for a checkup. These types of problems are more easily treated if dealt with promptly. So, what exactly are discs? The spine is made of a series of bones. The vertebrae, which can bend and twist because there are flexible, shock-absorbing ‘cushions’ between each of the bones. These are discs. A normal, healthy disc is very strong. It is stronger than the vertebrae itself. If you have a compression injury in a healthy spine. It is more likely to cause a fracture of the vertebrae rather than a disc injury.